We often base our work on assumptions that seem reasonable, only to find out later that those assumptions are not shared by those whom we serve. That major mis-communication affects the how people perceive the quality, effectiveness, and utility of the service that they receive. When it comes to higher education, do students share professional educators’ assumptions about what students should get out of college – which is essentially the fundamental purpose of higher education? Apparently not. If professors think the outcome of an undergraduate education is X, while students think it is Y, then one would expect students (and payers) to be dissatisfied. Broadly speaking, this seems to be the situation we find ourselves in today. This was eye-opening to me. The assumption that students comprehend the purpose of a university education the same as we do appears to be flawed – and thus an improvement opportunity. My personal view is that there should be a university-wide effort to help undergraduate students understand what they should get out of their college experience, because this is fundamental to the university’s reason for existence –and which strongly connects to ensuring a successful first year, improving graduation rates, developing skills to achieve life and career goals, and so on. I recommend sending ‘What You Should Get Out of College’ to undergraduate students upon admission, signed by the senior academic leadership team: president, provost, and appropriate dean. It should also be reinforced by the senior academic leadership team to all students, both undergraduate and graduate, via personalized e-mail, annually or at the start of each semester. Overall, students had negative views of general education courses. They perceive them as busy work, lacking relevancy, and disconnected from the real world. 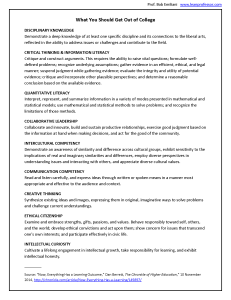 The attached document can help change those perceptions, but ultimately the professors teaching gen ed courses, as well as in-major courses, can improve their focus on real-world relevancy and learning. I did not hear anything more from the president or provost (or dean) for three months. At my prompting a few days ago (5 March), the provost replied with a bureaucratic response that essentially said, “We’re already doing that.” But, of course, that is not actually the case. In my view, the bureaucratic response and absence of any action provide additional evidence that the interests of higher education administrators is with matters other than students, teaching, and learning. It also illustrates a general lack of interest in continuous improvement in higher education, which is surely to its detriment.